At Ridgeview, our approach is unique because everything we do is grounded on a foundation of financial partnership. We begin each relationship with intense listening. We then develop a detailed plan to execute on a wealth strategy built for each client. Investing in the same strategies and process with our client partners, we constantly focus on costs, tax considerations and long-term risk-adjusted returns. We view each client’s investment strategy in totality, matching the client’s investment portfolio with their goals and risk tolerance. Working closely with each client, we constantly strive to minimize conflicts of interest and we pursue only the best investment opportunities that meet the specific needs of each client. Clients always come first at Ridgeview. We start each relationship by listening closely. Client goals are our goals, and our relationship is collaborative, open, and honest. 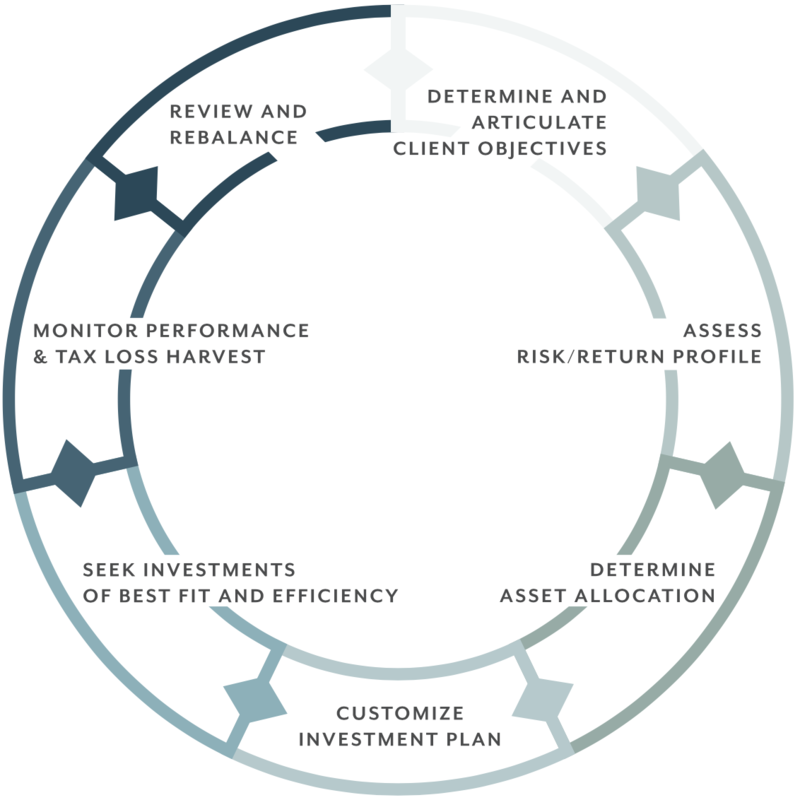 We construct a plan for each client that carefully considers their short- and long-term goals, appetite for risk, the detailed complexity of their current assets, and tax considerations, among other factors. We then implement and monitor that plan carefully, remaining nimble so we can adapt and adjust to an ever-changing investment landscape. We constantly review performance, making adjustments as appropriate to optimize client expectations. We leverage a variety of sustainable fixed income and equities solutions, with specific allocations reflecting the risk tolerance of each client. This includes the specific needs and guidelines related to their tax position. The investment mix may also include alternatives such as real estate, private equity, opportunistic investments, and direct investments. Clients always retain custody and control of their assets. We utilize demonstrated technologies and management tools to identify and leverage robust solutions, including portfolio algorithms, structured investment products, unique alternative funds and direct private investment opportunities. Our approach is disciplined and long-term; we strive to optimize risk adjusted returns. In our process, we try to remove human emotion as much as possible from the investment process.